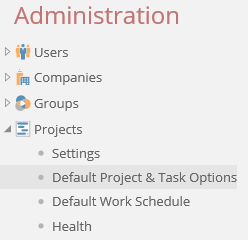 Default Task Options in the Administration section is where the most commonly used options for tasks are set so they don't have to be set for each individual task. There is also a tab to set default options for projects. See Default Project Options for more information. Only System Administrators can change the Default Task Options. Click on Projects. This will automatically display the Default Project Options form. Optionally, click on the sub-menu under projects called Default Project & Task Options. Most of the settings on this form are defaults only and can be changed on an individual task basis as required. See Project Options for more information. These settings are applied automatically to new projects except where you create a project from a template. If a project is created from a template, then the settings from the template are used instead of these defaults. Most of these settings can be changed on an individual task by task basis (see Add Task - Advanced but there are some tasks settings that aren't changed individually by task, they are set at the project level and apply to all tasks. These are the options that have the "Apply to all projects" settings. The options that can be set on an individual task level have the "Apply to all projects & tasks". If you change these settings and there are already existing projects/tasks, the settings on those projects won't be effected by the changes unless you click on the "Apply to all projects" or "Apply to all projects & tasks" check boxes. Checking this will change settings for all projects in the Active, Planning and Template state. Note it will over-ride any options set individually on those projects so use caution when checking this option. The 'Auto-populate work from duration when work is not set' feature will pre-fill any null (blank) work values on the task based on a default value of one resource assigned to the task with 100% allocation. For example, entering a five day duration will pre-fill 40 work hours in a task which has no previously assigned value in the work field. The work field can be manually changed from 40 hours to any other value, but it will default to 40. The 'Auto-populate duration from work when duration is not set' feature will pre-fill any null (blank) duration values on the task based on a default value of one resource assigned to the task with 100% allocation. For example, entering 40 work hours will pre-fill five days of duration in a task with no value in the duration field. It can be manually changed from five days to any other value, but it will default to five. If resources are expected to track time for most of the tasks in most projects, you will want to set this option as the default so that tasks entered in the project are automatically set to allow time entries. This value may be changed individually for each task on a task-by-task basis during the task add or edit process to differentiate those tasks which should have time entries from those which should not. Enables the billable flag to be checked by default when entering time for the project or task. Enables the resource the ability to toggle the billable flag when entering time for the project or task. Each time entry will have an equal hours value in the 'Billable Hours' to the 'Actual Hours' entered by the resource if the flag is set on (Billable box checked), and a value of 0 'Billable Hours' regardless of the 'Actual Hours' value if the flag is set off (Billable box not checked). This option should only be allowed if the resources entering time are highly dependable in determining which time entries should and should not be billed. If resources are expected to track expenses to most of the tasks in most projects, you will want to set this option as the default so that tasks entered in the project are automatically set to allow expense entries. This value may be changed individually for each task on a task-by-task basis during the task add or edit process to differentiate those tasks which should have expense entries from those which should not. Enables the billable flag to be checked by default when entering expenses for the project or task and will set all of the expense entries on this task to billable by default. Enables the resource to toggle the billable flag when entering expenses for the project or task' and will allow the resource to switch the billable flag on or off while entering expenses. Each expense entry will have an equal monetary value in the 'Billable Expense' to the 'Actual Expense' entered by the resource if the flag is set on (Billable box checked), and a value of 0 'Billable Expense' regardless of the 'Actual Expense' value if the flag is set off (Billable box not checked). This option should only be allowed if the resources entering expenses are highly dependable in determining which expense entries should and should not be billed. Enables a task resource to edit custom fields for tasks on the task display form and sets up existing custom task fields for editing in the resource task update form. 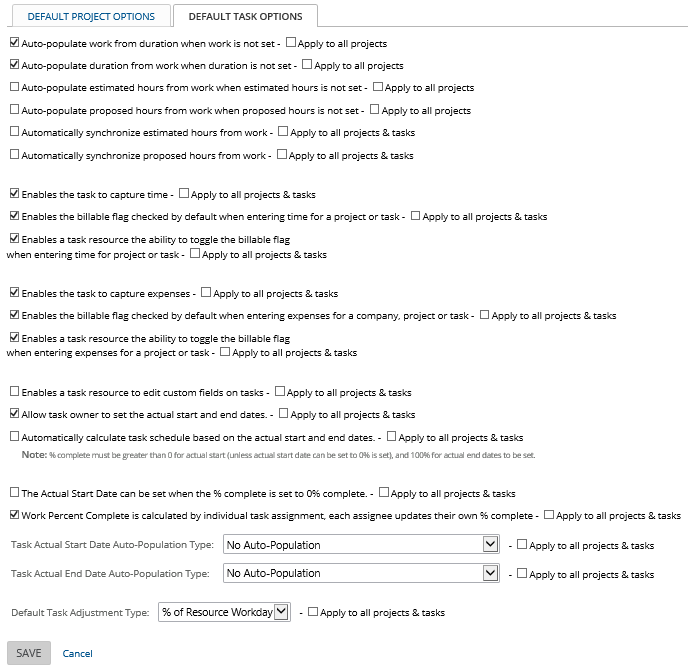 Custom task fields are configured by system administrators, while control as to whether or not the resources can edit these fields for tasks assigned to them is maintained by the project manager for each project. The project manager may choose to allow the resources to update custom field data or maintain control of the custom fields by only allowing the project managers access to editing the data in the custom fields. Task owners may update actual start and end dates for their tasks with this option. This allows project managers to see the actual performance dates for the tasks, as entered by the task owners, which may differ from those dates on the schedule. The actual and planned scheduled dates are maintained in separate data fields so that changes to the actual dates do not have to force changes to the schedule. 'Automatically calculate task schedule based on the actual start and end dates' will change the project schedule when actual dates entered by the resources differ from the scheduled dates entered by the project managers. This will only occur if the percent complete for a task is greater than 0. This setting is only recommended for project managers who understand that the schedule will change without their intervention as resources update tasks. For example, a resource updating a 4 day duration task to 25% complete one day before its scheduled start date will automatically update the task schedule to start one day earlier than the original schedule. Enabling 'The Actual Start Date can be set when the % complete is set to 0% complete' will allow the user to place an Actual Start Date value even if the % complete is set at 0. Thus, this bypasses the default setting which will not allow a user to set an Actual Start Date if the percent complete for a task is not greater than 0. Enables the Work Percent Complete to be calculated by individual task assignment and allows each resource to update % complete - see Individual Task Assignment to Work Status documentation. Each task has an actual start date (which is the date it actually started versus the date it was scheduled to start). Project managers can change or enter the actual start date and if the option Allow Task Owner to set the actual start and end dates is checked (see above) then the task owner can also enter or change this date. In addition, tasks can have the actual start date automatically populated in different ways. The PM or task owner can always change that default unless one of the options with "...No Editing Allowed" is used. In that case the actual start date is automatically populated based on the setting and then can't be changed. No Auto Population will require that the actual start date is filled in manually. Otherwise, the actual start date remain null/blank. Scheduled Date will change the actual start date/time to match the scheduled start date/time as soon as the percent complete for the task is changed to something other than 0% complete. % Complete Updated Date will change the actual start date to match the date that the task is changed from a percent complete of 0% to a percent complete of greater than 0%. The start time will be set to be the same as what is set in the task's work calendar start time for that day. % Complete Updated Date, No Editing Allowed is the same as above without an option to change the date/time with a manual entry override. % Complete Updated Date & Time will change the actual start date and time to match the date and time that the task is changed from a percent complete of 0% to a percent complete of greater than 0%. % Complete Updated Date & Time, No Editing Allowed is the same as above without an option to change the date/time with a manual entry override. Time Entry Date, when Updated will update the actual start date/time to match the date/time of the earliest time entry in the task. Time Entry Date, when Updated, No Editing Allowed is the same as above without an option to change the date/time with a manual entry override. If one of the % Complete options are used and a task is marked to 100% complete, the actual start date will be automatically entered, but if the percent complete is then changed back to something other than 100%, the actual start date will be removed. Each task has an actual end date (which is the date it actually ended versus the date it was scheduled to end). Project managers can change or enter the actual end date and if the option Allow Task Owner to set the actual start and end dates is checked (see above) then the task owner can also enter or change this date. In addition, tasks can have the actual end date automatically populated in different ways. The PM or task owner can always change that default unless one of the options with "...No Editing Allowed" is used. In that case the actual end date is automatically populated based on the setting and then can't be changed. The actual end date cannot be entered unless the task is completed (100% complete). No Auto Population will require that the actual end date is filled in manually. Otherwise, the actual end date remain null/blank. Scheduled Date will change the actual end date/time to match the scheduled end dat/time upon completion. % Complete Updated Date will change the actual end date to match the date that the task is changed to a percent complete of 100%. The end time will be set to be the same as what is set in the task's work calendar end time for that day. % Complete Updated Date & Time will change the actual end date and time to match the date and time that the task is changed to 100% complete. Time Entry Date, when Updated This option isn't applicable to the actual end dates. Time Entry Date, when Updated, No Editing Allowed This option isn't applicable to the actual end dates. If one of the % Complete options are used and a task is marked to 100% complete, the actual end date will be entered, but if the percent complete is then changed back to something other than 100%, the actual end date will be removed. Task schedules must calculate with a formula which measures the resource(s) work allocation to the task (% of Resource’s Workday), the duration within which the work will be performed (Task Duration) and the amount of work required for the completion of the task (Resource’s Work). You may select the default calculation for new tasks to use based on the value which is most difficult to mathematically determine during the task data entry. Based on the value selected in this drop-down selector, the other two values will need to be entered by the project manager. This calculation may be changed at the task level on a task-by-task basis using a drop-down selector in the task form which is identical to this one. % of Resource’s Workday is the default, as it is the most commonly used and the easiest to understand. This calculation allows the project manager to set a schedule based on the duration of the task, while manually entering the total work (hours) to complete the task. The system then automatically calculates the percentage of each of the resource’s workdays that will need to be allocated in order to complete the task. Resource Work allows manual entry of the duration and the % of resources workday, then uses those values to automatically calculate the total work that will be applied to the task. Task Duration allows the manual entry of the total work and % of resource’s workday. This setting will calculate the duration automatically after the task is submitted. If multiple resources are assigned to the task, the duration will calculate based on the duration for the resource who requires the longest duration to complete the task. The % of resource’s workday for all other task resources will adjust in accordance with the duration value calculated above. Click Save to save your settings and update any existing tasks you clicked Apply to all Tasks. Note* Clicking Save will also save any changes that were made on the Default Project Options tab.